I just love Queensland, I've lived there on three different occasions, I first moved there in the 1980's when I was in my early 20's, and returned to South Australia about 2 years later and then we moved there again in the early 1990's for a few months. My family (my sons, their dad and myself) then moved back in 1993 and stayed until 2001. Queensland is a gorgeous place and I loved living there and my sons loved growing up there, it's just very laid back, easygoing and a great place to bring kids up, I found. There was always something to do in the sunshine state; we used to go quite often to the beaches on the Gold Coast or we'd jump on the motorway and head up to the Sunshine Coast beaches. One of our favourite things to do with the kids was to take them to the theme parks down the coast, there was Dreamworld, Movie World, Sea World and many more. The boys just loved going to see the tigers at Tiger Island in Dreamworld; we were there when it first started and saw the first tigers, I remember like it was yesterday that our favourite was a white tiger called Mohan, we went back quite a few times and just loved watching him grow, he was spectacular. Unfortunately Mohan passed away in June 2012, he was 17 years old. My youngest son did get to see him again when he went back to Queensland and visited Tiger Island not very long before he passed away, he was a beautiful tiger.... RIP Mohan. You can get everything you need to know about the sunshine state in our information-packed video. The Capital of Qld is Brisbane. 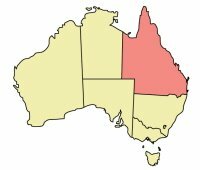 Qld was settled in 1824 as a penal colony under the authority of New South Wales, it served as a penal colony until 1843. In 1842 free settlement was permitted to begin. Qld was separated from NSW and made a British colony in 1859. Queensland is the 3rd most populated of the Australian states with about 4,180,000 people living there, almost half of these live in the Brisbane metropolitan area. Qld is the fastest growing Australian state, with about 1500 people moving there every week. The population of Qld is concentrated in the southeast corner of the State, which includes the capital city of Brisbane and the Gold and Sunshine Coasts. Qld has quite a few other major regional centres, the majority of which are situated along the coast, including Cairns, Townsville and Mackay. Our brother, Rodney, who was nicknamed the little fella by the family, passed away in September 2011 (rest in peace mate, gone but never forgotten), lived for many years in Central Qld in a town called Bedourie, which is between Boulia and Birdsville (famous for the Birdsville races), he worked for the Bedourie council for over 30 years, we didn't see him very often, though he did go to Brisbane at Christmas most years to stay with another brother, Mark who lives there with his family. Qld has the fastest growing economy in Australia and has enjoyed a boom in the mining and tourism industries over the last twenty years. The chief crop of Qld is sugarcane, it also produces cotton, wheat and tropical fruits. Qld is also Australia's leading producer of beef. Brisbane is the Capital of Qld and the 3rd largest city in Australia after Sydney and Melbourne. It is situated on the Brisbane River, close to the Pacific Ocean, in south eastern Qld. Qld has wonderful scenery and much to offer with the beautiful sandy beaches, the gorgeous tropical rainforests of the far north, the vast open plains of the outback, the extensive wilderness areas and mountains, the beautiful relaxed and unspoilt Sunshine Coast and, of course, the wonderful Great Barrier Reef, all of this combined with the excitement and fun of the adventure parks on the Gold Coast and the exciting nightlife of the Gold Coast and Brisbane make the Sunshine State Australia's No 1 tourist destination. The main code of football in Queensland is Rugby League although they have got a couple of teams in the AFL (Aussie Rules) these days. A person from Qld is called a Queenslander. The colloquial term for a Queenslander is a banana bender; Well they grow bananas there and the joke was Queenslanders spent their time bending them, so they're banana benders! The State Flag of Qld has been in use since 1876. It shows the Union Jack and the Qld State badge. 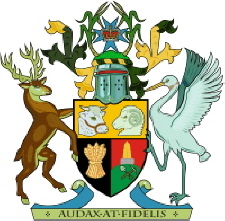 Qld was the first State to be granted a Coat of Arms in 1893 by Queen Victoria. The Qld motto is "Bold, Aye, and Faithful Too". Slogan for Qld: Sunshine State, Smart State or Beautiful one day, perfect the next.